Unit is constructed of heavy #7 gauge carbon steel and painted with a heavy duty Durethane finish. 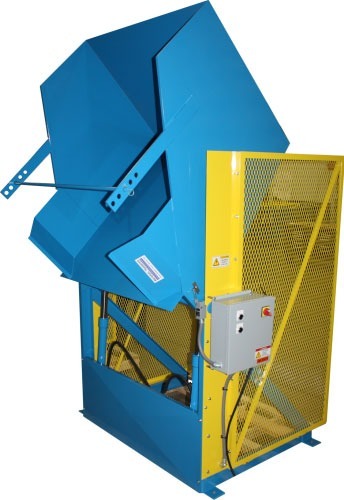 Loading skip is 52” wide x 42” deep with a 40” wide discharge opening. Unit has a 2,500# operational capacity. 48″ discharge height and 7” dumper projection. Welds on interior of loading skip are continuous. Five position adjustable height retainer bar to prevent excessive movement of container during dump cycle. Dual pivot cylinders for smooth bucket rotation. Unit features a “Zero Force” safety touch button with guard for operator safety. Unit includes a front enclosure to prevent damage to the hydraulic pump. Unit features a 20 amp, IEC rotary cam disconnect switch in control panel for maintenance purposes. 2 GPM hydraulic system with carbon steel reservoir and 2 HP TEFC motor.